Immunisation has contributed greatly to the control of vaccine-preventable diseases and therefore to improvements in health and survival, especially among young children, and remains one of the most successful and cost-effective public health interventions. This remains true for many of the newer, more expensive vaccines. Vaccines against invasive pneumococcal disease and rotavirus infection were introduced into the South African Expanded Programme on Immunization in April 2009. This article describes the rationale for and process of the introduction of these two vaccines, pneumococcal conjugate vaccine and rotavirus vaccine. It also aims to evaluate the success of and challenges related to their introduction, in terms of both achieving universal coverage and improving survival and health in South African children. While progress has been made in preventing deaths due to some of the vaccine-preventable diseases (e.g. measles deaths reduced from 535 000 in 2000 to 139 000 by 2010), a greater proportion of vaccine-preventable deaths is now attributed to diseases for which there are under-utilised and/or newly developed vaccines, such as those against pneumococcal disease and rotavirus. Although these vaccines are widely used in developed and well-resourced countries, their use in middle- and lower-income countries has remained limited, mainly owing to the high costs of the vaccines. Worldwide it was estimated that pneumococcal disease was responsible for 14 million severe cases and 830 000 deaths in 2000, and that there were 7 million severe cases of rotavirus diarrhoea and 453 000 deaths in 2004. Significant declines in severe disease and/or mortality from these pathogens have been demonstrated in countries where the newer vaccines were introduced into public immunisation programmes. [4,5] In the absence of targeted vaccination, rotavirus remains the most common cause of severe diarrhoea (associated with 28% of cases) and Streptococcus pneumoniae is still responsible for a high proportion (18.3%) of cases of severe pneumonia. In 2007, the World Health Organization (WHO) recommended that countries with under-5 mortality rates of >50/1 000 live births, and with a high prevalence of HIV or conditions that increase the risk of pneumococcal disease, should prioritise the introduction of the 7-valent pneumococcal conjugate vaccine (PCV-7) in their national immunisation programmes. Similar recommendations for rotavirus were subsequently issued. These global recommendations were premised in part by pivotal studies that had been undertaken in South Africa (SA). These included a study on a 9-valent PCV in which vaccine efficacy was established against vaccine-serotype invasive pneumococcal disease in HIV-uninfected (83%) and HIV-infected children not on antiretroviral therapy (ART) (63%), as well as against pneumonia in the first 2 years of life. Also, a vaccine efficacy study on rotavirus vaccine (RV) observed 73% protection against rotavirus-associated severe diarrhoeal disease in the SA setting, with its high prevalence of HIV infection. Although the efficacy study on RV was not specifically powered to evaluate for protection in HIV-infected children, the immunogenicity and safety of RV in this group had been established in a separate SA study. SA was the first country in Africa to introduce PCV and RV into its routine Expanded Programme on Immunization (EPI). PCV-7 was introduced in April 2009, followed by RV in August of the same year. The 13-valent pneumococcal conjugate vaccine (PCV-13), estimated to confer a further 20% protection against invasive pneumococcal disease (IPD), replaced PCV-7 in May 2011. The introduction of these vaccines into the SA EPI was particularly notable, this country having been classified as a middle-income country and therefore ineligible for external donor support from the Global Alliance for Vaccines and Immunization for procurement of these vaccines. Consequently in SA, where all healthcare for children is free of charge, government increased its budget allocation for the procurement of childhood vaccines from approximately R200 million to R1.25 billion per annum. Implementation of the new vaccines (which are packaged as prefilled single-dose syringes) also required further investment for doubling cold-chain capacity at both depot and facility level (personal communication - EPI, National Department of Health). The EPI schedule, which includes RV and PCV is available online (http://www.doh.gov.za). On the advice of the National Advisory Group for Immunization (NAGI), SA adopted a dosing schedule different to that recommended by the WHO at the time. In contrast to the WHO schedule, which recommended that PCV be given at 6, 10 and 14 weeks, the PCV dosing schedule used in SA is a primary series at 6 and 14 weeks of age and a booster dose at 9 months of age, aimed at possibly extending the duration of protection against IPD in HIV-infected children, who at the time of implementation accounted for two-thirds of cases. This was decided upon to address specific observations of waning immunity among HIV-infected children noted in the SA PCV vaccine efficacy trial, and also to manage logistical issues with the simultaneous introduction of PCV and RV into the EPI. The immunogenicity of the implemented PCV dosing schedule has since been confirmed in SA children, including demonstration of higher antibody concentrations after the third dose at age 9 months compared with administration at age 14 weeks in the 6-, 10-and 14-week dosing schedule recommended by the WHO. The rationale for RV being incorporated as a 6- and 14-week schedule was premised upon attempting to induce at least partial immunity as early as possible, i.e. the first dose at age 6 weeks rather than 10 weeks, while the decision to administer the second dose at 14 weeks was based on assisting with training in and the logistics of implementation of the concurrent introduction of PCV and RV into the EPI. The immunogenicity of RV using the 6- and 14-week schedule, including with the first dose being administered concurrently with the oral polio vaccine, has also been confirmed. The National Department of Health monitors the EPI programme performance using routine data submitted through the District Health Information System (DHIS). Coverage for a particular vaccine is calculated by dividing the number of doses that are reported to have been administered (predominantly in primary healthcare facilities) by the target population (based on mid-year population estimates published by Statistics South Africa and derived from census data). The DHIS estimates for coverage with the third dose of PCV at 9 months of age increased from 10.4% in 2009 at the start of the PCV immunisation programme to 64.3% in 2010 and 99% in 2012 (unpublished data - DHIS, extracted May 2013) (Fig. 1). 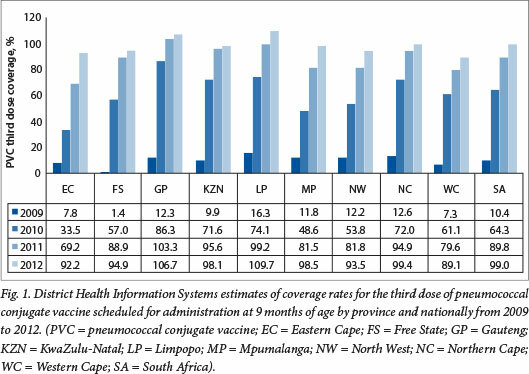 The >100% coverage rates observed in provinces such as Gautengand Limpopo highlight the limitations of the DHIS as a tool for measuring vaccine coverage, probably resulting from inaccurate population denominators. Similarly, national coverage estimates for the second dose of RV administered at 14 weeks of age increased from 66.5% in 2010 to 100.6% in 2012 nationally (Fig. 2). The differences in coverage estimates for the two new vaccines are smaller than the differences in coverage estimates for more traditional vaccines (e.g. for 2012 the WHO/UNICEF estimated coverage of the third dose of DTP to be 68% compared with a DHIS figure of 93%). This situation arises from the fact that WHO/UNICEF estimates of vaccine coverage are adjusted for differences in coverage rates between administrative reporting by government (i.e. 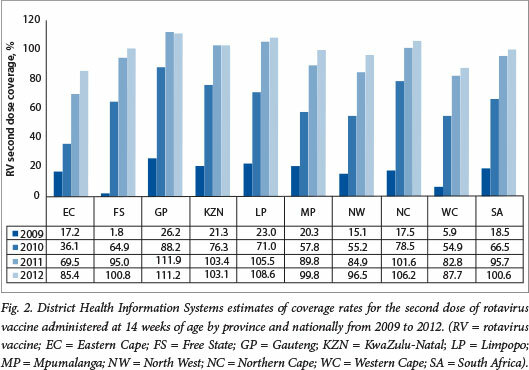 DHIS figures in SA) and the actual coverage prevalence observed at the time of the last coverage survey undertaken in the country. In SA, the last representative population-based survey with immunisation coverage figures that were considered valid was undertaken in 1998. However, the WHO/UNICEF use coverage data from the 2003 Demographic and Health Survey, which had limitations and did not produce reliable immunisation coverage figures. All subsequent WHO/UNICEF estimates have been adjusted downwards in line with the difference between administrative and survey estimates from 2003. A drawback of this methodology is that it is oblivious to any changes, e.g. strengthening or weakening of the EPI, which are likely to have occurred over more than a decade in a country like SA. Furthermore, WHO/UNICEF estimates are characterised by internal inconsistencies. For example, coverage estimates for the third doses of Haemophilus influenzae type b conjugate vaccine (HibCV) and diphtheria-tetanus (DTP) toxoid-whole cell pertussis (DTP combination vaccine) show considerable variation, despite the fact that the lyophilised HibCV is re-constituted with DTP in SA, so that the coverage for these vaccines should be identical. Unfortunately, in the absence of a recent high-quality immunisation coverage survey in SA, vaccine coverage remains uncertain. However, both the DHIS data and the WHO/UNICEF data suggest that coverage of the new vaccines had reached levels comparable with those of the traditional vaccines 2 years after introduction. SA should have been well suited to measure the impact of the introduction of PCV and RV in reducing under-5 morbidity and mortality, owing to the structure of the healthcare system. In particular, although there is a parallel private sector, the majority (>80%) of the population is cared for in the public health sector because of lack of private medical insurance coupled with the high cost of private care. Also, impediments to access to healthcare are addressed by free healthcare being provided to children <6 years of age, including hospitalisation and immunisation services. Unfortunately weaknesses in the vital registration systems, including delays in availability of updated mortality data, coupled with a limited healthcare information system, pose a challenge to accurately quantifying the cost-benefit and impact of the introduction of these new vaccines into the public healthcare system. The usefulness of established and functional health information systems for demonstrating the impact of vaccines has been demonstrated in other middle-income countries such as Mexico, which has a similar gross domestic product and healthcare system to SA. The Mexican Ministry of Health electronic hospital registries show that RV reduced all-cause diarrhoea hospitalisation by 40%, and all-cause diarrhoea mortality declined by 35% following RV introduction. [20,21] Notably, such differences were evident in a diversity of socioeconomic settings in Mexico. Similarly, electronic databases were used in the USA to demonstrate a 36% reduction in all-cause pneumonia hospitalisation in children <2 years of age within 3 - 4 years of PCV introduction, an effect that was sustained even a decade after PCV introduction. A number of other countries have also variably used available health data registries to measure the public health impact of PCV and RV on pneumonia and diarrhoea hospitalisation, respectively. SA faces an additional challenge in understanding the impact of the introduction of PCV and RV in that this has taken place in parallel with changes in mother-to-child transmission (MTCT) of HIV programmes, as well as more effective management of HIV-infected children. Temporal trend data should therefore be interpreted in the context of these changes, which individually may impact on the incidence of pneumonia and diarrhoea as well as hospitalisation and mortality. In an effort to quantify the impact of the introduction of the two vaccines on child health and survival in SA, data from a number of sources were reviewed, and are summarised below. Case-control studies have been undertaken to establish vaccine effectiveness for PCV and RV, to corroborate the results observed in the efficacy trials in SA. These have included studies to determine PCV vaccine effectiveness against pneumonia and IPD, as well as RV effectiveness against all-cause and rotavirus-associated diarrhoea hospitalisation. Using the case-control study design, a multi-centre study in SA reported that PCV vaccination was associated with a 69% (95% confidence interval (CI) 7 - 90) reduced odds of hospitalisation for vaccine-serotype IPD and a 46% (95% CI 0 - 71) lesser likelihood of hospitalisation for IPD due to any serotype in HIV-uninfected children older than 16 weeks of age. However, the study failed to confirm PCV effectiveness against vaccine-serotype or overall IPD in HIV-infected children, despite having access to ART. The reason for this remains unclear and has led to the NAGI recommending that HIV-infected children should receive an additional dose of PCV at 10 weeks of age (i.e. a 3+1 dosing schedule). The immune responses following two doses of PCV given at 6 and 10 weeks of age were, however, similar in HIV-infected SA infants on ART compared with HIV-uninfected SA infants. Furthermore, provisional results of a case-control study also showed that PCV-immunised, HIV-uninfected children were 27% (95% CI 0 - 49) less likely than unimmunised children to be hospitalised for presumed bacterial pneumonia. A multi-centre, case-control study to evaluate the effectiveness of RV against rotavirus-associated diarrhoea hospitalisation is also nearing completion. While case-control studies are useful for measuring the direct effectiveness of the vaccines, they are less informative in helping us understand the public health impact of the vaccines. The latter is best captured by examining temporal trends in disease in conjunction with introduction of various interventions, such as vaccines. (742/1 077) reduction by 2011, compared with 2009. These data corroborate the findings of a review on the public health impact of RV in middle-income Latin American countries. Observations from the review included that RV immunisation was associated with a 22 - 41% reduction in gastroenteritis-associated mortality, a 17 - 51% reduction in all-cause gastroenteritis-associated hospitalisation, and a 59 - 81% reduction in rotavirus-specific gastroenteritis hospitalisation among children younger than 5 years of age. Additionally, an ecological study is underway to establish the effectiveness of PCV against IPD, for which there has been surveillance for more than a decade before vaccine introduction in SA. [29,30] Provisional data up to the end of 2011, during which time 7-valent PCV was being used, showed a 79% reduction in vaccine-serotype IPD and a 28% decline in non-vaccine-serotype IPD in SA when comparing 2005 - 2008 with 2011. The greater decline in vaccine-serotype IPD compared with non-vaccine-serotype IPD suggests that while some of the decline may have been due to reduced MTCT of HIV and improved access to ART for HIV-infected children, PCV immunisation also contributed. Other studies underway in SA include an ecological study in Soweto, Johannesburg, with a population of ~1.25 million people and an annual birth cohort of 29 000. This study aims to measure the effectiveness of PCV and RV immunisation on all-cause pneumonia and all-cause diarrhoea hospitalisation, which would provide more insight into the public health impact of immunisation with these vaccines, albeit in a limited geographical locality. Although a national health usage registry has not been established in SA, some data on hospitalisation and in-hospital mortality are available. Included among these sources are the DHIS and Child Healthcare Problem Identification Programme (Child PIP). The DHIS collates data that are routinely submitted by public healthcare facilities. Data on the incidence of pneumonia and diarrhoea with dehydration in children <5 years of age are collected. Furthermore, data on in-hospital case fatality rates among children <5 years of age admitted to public hospitals are also collected. While the completeness and quality of data collected through the DHIS have improved substantially over the past years, trends should nevertheless be interpreted with care. Based on the DHIS data on pneumonia and diarrhoea in children <5 years of age for the period 2007 - 2012, the incidences for both diarrhoea and pneumonia have shown a downward trend (Table 1). This includes a steady decline in the incidence of diarrhoea with dehydration from 2008 to 2009 compared with later years, including a 44% reduction by 2012. Furthermore, there was a decline in the incidence of pneumonia from ~96/1 000 in 2008 - 2009 to 69.3/1 000 by 2012 (a 28% decrease) (Table 1). There has been an ~40% reduction in case fatality rates associated with diarrhoea and pneumonia (Table 1). Another source of mortality data in public hospitals is available from Child PIP, a child mortality audit system that is increasingly being used in hospitals throughout SA. Data on the absolute number of under-5 deaths from acute diarrhoea and pneumonia, and the proportions of all deaths with which they are associated, from 41 hospitals that have consistently submitted data from 2008 to 2012 are shown in Table 2. During this period, the number of deaths from diarrhoea has shown a steady decline, and was 56% lower in 2012 (N=244) than in 2008 (N=556) (Table 2). Similarly, there has been a steady decline in deaths from pneumonia, which decreased by 53% between 2008 (N=692) and 2012 (N=326). The proportions of all under-5 deaths attributed to diarrhoea (19.4% in 2008 and 16.2% in 2012) and pneumonia (24.2% in 2008 and 21.6% in 2010 - 2012), while also showing a downward decline, nevertheless highlight the continuing contribution of these syndromes to under-5 mortality in SA (unpublished data, Medical Research Council, Child PIP, extracted 5 August). Analysis of a smaller number of hospitals (N=18) that have submitted complete data for the period 2007 - 2012 showed an increase in the number of deaths from diarrhoea and pneumonia between 2007 and 2008, followed by declines (Table 3). Although data on the HIV status of children who die are collected during the Child PIP mortality audit process, the incompleteness of data makes interpretation thereof difficult. Data on the HIV-infection status of children who died from pneumonia (from the 18 hospitals with complete data) are shown in Table 4. Despite the increase from 2007 to 2012 in the percentage of children in whom HIV infection status was established at the time of their death, there has been a decline in the number of deaths involving HIV-infected children (from 80 in 2007 to 24 in 2012, a 70% reduction). In contrast, the number of deaths of children who were confirmed as being HIV-uninfected has remained steadier over this time, albeit with an increase in the number in whom HIV testing was undertaken. This would therefore also suggest a decline in deaths among HIV-uninfected children between 2007 and 2012. Table 5 shows the number of children <5 years of age from 18 hospitals whose deaths were attributed to diarrhoea (data from Child PIP). Similar to all-cause deaths, an increasing proportion of children who died of diarrhoea were tested for HIV infection in 2012 compared with earlier years; nevertheless, there was a trend towards a decline in diarrhoea deaths associated with HIV infection and among HIV-uninfected children (Table 5). Importantly, the Child PIP database is not population denominator centred, and hence is unable to provide incidence trend data at a population level. Also, as the reporting is based on summary data for the hospitals instead of individual patient data, it is not amenable to being used to determine issues such as HIV-stratified trends in incidence of diseases to help distinguish between the relative contribution of PCV and RV compared with changes in HIV management in reducing under-5 childhood mortality in SA. A significant decline (30%) in under-5 mortality has been observed in SA between 2006 and 2011. The United Nations estimates that under-5 mortality declined from 75.8/1 000 live births in 2006 to 46.7/1 000 live births in 2011, and in addition there has been an estimated 48% reduction in diarrhoea-associated mortality and a 19% reduction in pneumonia mortality021 A major factor contributing to this decline in under-5 mortality has been a 47% reduction in deaths attributed to HIV/AIDS and related complications. This accomplishment has been driven by improved management of HIV-infected children with ART since 2006, as well as improved coverage with a more aggressive ART regimen for pregnant women aimed at reducing MTCT of HIV. The rate of MTCT of HIV has declined from 9.6% in 2008, when mainly nevirapine was used for the prevention of MTCT, to approximately 2.8% with more aggressive ART regimens having been implemented. The model used for estimating the causes of under-5 mortality attributes all deaths in HIV-infected children to AIDS, although the major direct causes of death in these children are similar to those in the general population, i.e. pneumonia and diarrhoea. The risks of morbidity and mortality from common childhood illnesses such as pneumonia and diarrhoea are, however, much increased in HIV-infected children. Prior to the widespread management of HIV-infected children with ART, the risks of hospitalisation for pneumonia and diarrhoea were 9-fold and 5.4fold greater, respectively, among HIV-infected than HIV-uninfected SA children. [34,35] Also, HIV-infected children in SA had a 40-fold greater risk of hospitalisation for invasive pneumococcal disease and an estimated 2.3-fold increased risk of hospitalisation for rotavirus diarrhoeal disease than HIV-uninfected children. [35,36] Although improved access to ART has mitigated some of this risk, even in the era of ART HIV-infected children remain at a 20-fold greater risk of developing invasive pneumococcal disease. Furthermore, even when ART was initiated early in HIV-infected infants, pneumonia and diarrhoea were individually identified as the causes of death in one-third of HIV-infected children. 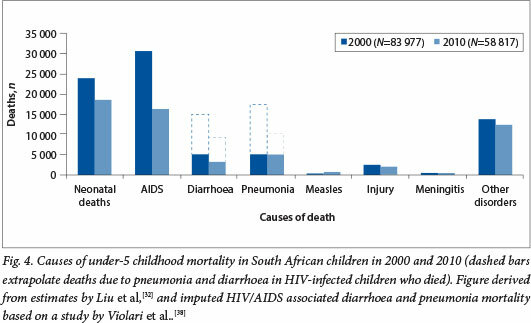 Extrapolating from the direct causes of death in SA children with HIV/AIDS, the imputed proportions of all under-5 mortality that could be attributed to pneumonia and diarrhoea in 2010 were ~19% (AMI 000) and ~15% (N=9 000), respectively (Fig. 4). While further reduction in vertical transmission and improved ART management of HIV-infected children remain the mainstay of reducing HIV/ AIDS-associated morbidity and mortality, additional complementary interventions such as immunisation with new and under-utilised existing vaccines would contribute further towards reducing morbidity and mortality in this high-risk group. SA has demonstrated a clear commitment to reducing child mortality and to ensuring universal access to life-saving vaccines by being at the forefront in introducing new vaccines such as PCV and RV into its childhood EPI. While exact coverage levels remain contested, coverage with the new vaccines has been scaled up rapidly to levels comparable to those of traditional vaccines. The uncertainty around immunisation coverage remains a serious challenge, and in the absence of a recent high-quality survey in SA, vaccine coverage remains uncertain. This limits government's ability to accurately monitor and improve EPI performance. Furthermore, the WHO and UNICEF will not change their estimates of SA's coverage figures until a valid coverage survey is conducted, as they rely on recent coverage surveys to produce country coverage estimates and will not use only administrative figures reported by a country. The effects of these new vaccines on under-5 childhood morbidity and mortality in SA are challenging to measure with existing data sources. Overall child mortality rates have declined substantially in the past 5 years, while data from a number of sources show substantial declines in the incidence of diarrhoea with dehydration and pneumonia, as well as in hospitalisations and deaths from diarrhoea and pneumonia. However, since pneumonia and diarrhoea are also leading causes of death in HIV-infected children, the relative impact of improvements in HIV prevention and management is difficult to disentangle from the decline in pneumonia and diarrhoea morbidity and mortality due to the introduction of the vaccines. The reduction in diarrhoea mortality may at least in part be related to improved access to tapped potable water, which has been associated with significant global reductions in deaths from diarrhoea, and specifically diarrhoea caused by bacteria. As HIV-associated child mortality declines, further child survival gains will depend increasingly on preventing deaths among HIV-uninfected children. The reductions in hospitalisation of HIV-uninfected infants demonstrated in the case-control studies suggest that these vaccines will play an increasing role in preventing child morbidity and mortality in the future. Further challenges in addressing the effectiveness of PCV and RV immunisation in SA relate to the lack of electronic hospital registries, which would make measurement of the impact of PCV and RV on mortality and morbidity much simpler. It is strongly recommended that a high-quality immunisation coverage survey be conducted in every district and that an electronic hospital registry be implemented in SA. This would assist in better understanding of whether the substantial investment in vaccine procurement is translating into a benefit, particularly in impoverished districts and communities. Conflict of interest. SAM has received grant support from GlaxoSmithKline (GSK) and Pfizer (Wyeth) for studies related to PCV and RV. SAM also received honoraria from GSK and Pfizer and served as a temporary advisor to Pfizer and GSK.